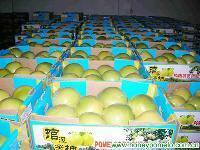 Guanxi honey pomelo is one of the traditional Precious fruits , it was used to be a tribute for royal. It can be stored for about 3 months naturally. 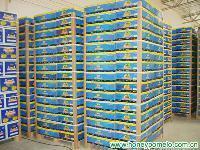 Honey pomelo is golden yellow or light green , the fruit is large but the skin is thin, and pulp has no seed, it not only tastes sweeter but a little sour, Juicy and soft, without leaving any residue, but also can be eaten directly ,used in salad or extracted juice. According to scientific research found that Per 100 ml pomelo juice contains 9.17~9.86 g sugar,0.734－1.011 g Titratable acid, 48.93－51.98 mg Vitamin C (at most 61.78 mg), meantime, it has magnesium, calcium, copper and other minerals and so on. Pomelo is used in treating cough, swelling, vomiting, indigestion, in removing phlegm and resolving alcohol toxins and hangover, uncouthly, it is a natural healthy food.